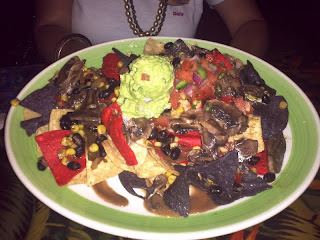 Recently, I dined at two chain restaurants that really impressed me with their veg-friendliness. The first is Rainforest Cafe, which really is a fun place to eat and shop! I really love all the mechanical animals that are moving around as you eat; it is like you are in a jungle! If you look up, you will see stars and periodically a shooting star will go zooming by, which I think is really cool. Also, every so often a storm will happen where the lights flicker, resembling lightening, and you'll hear thunder and see the animals moving around. The Rainforest Cafe that I dined at was in Burlington, MA and had a cool waterfall inside. Each one is slightly different, Burlington had a mechanical alligator in the entry that moves about, and the decor is really fun. The service was amazing! I called ahead to ensure a vegan dish was available. The server Dan was amazing, I couldn't dream up a nicer person, and Chef Paul was the best! They both took the time to talk with us to ensure we'd get to enjoy a truly vegan meal. Chef Paul was so excited to be able to put his culinary skills to the test, and had such great knowledge about vegan diet. He is the Head Chef and still took the time to come to our table twice, once to talk with us about what he was about to make, and twice to see how we liked it. What a cool experience! Special Rainforest Cafe vegan nachos to start! Chef Paul also made an awesome grilled veggie wrap that came with Safari Fries! The wrap had so many different veggies in it like fresh spinach, avocado, peppers, onions, and zucchini. It looked so great that I ate it so fast and forgot to take a picture! I thought to take one once it was already in my belly! So yummy; compliments to Chef Paul! The second restaurant we enjoyed eating at was P.F. Chang's China Bistro. I was excited to be able to review and dine at the Providence, RI opening weekend. This was my first time at P.F. Chang's. They have an entire vegetarian menu, but I was really impressed with the restaurant's partner Brian for coming by our table to tell me that everything contains sugar, and that he is almost positive its a bone char processed/ containing sugar, and he can substitute the sugar for a vegan cane sugar or agave nectar for me. That right there was damn impressive and told me that Brian knows a lot about food and the vegan diet. The decor was modern and contemporary. The service was wonderful, especially since it was a crazy-busy Saturday night on their grand opening weekend. We had a great time and our server was so funny! We had a lot of fun joking with her and felt like we knew her forever. You know someone is an experienced server when you feel like they are one of your pals. P.F. 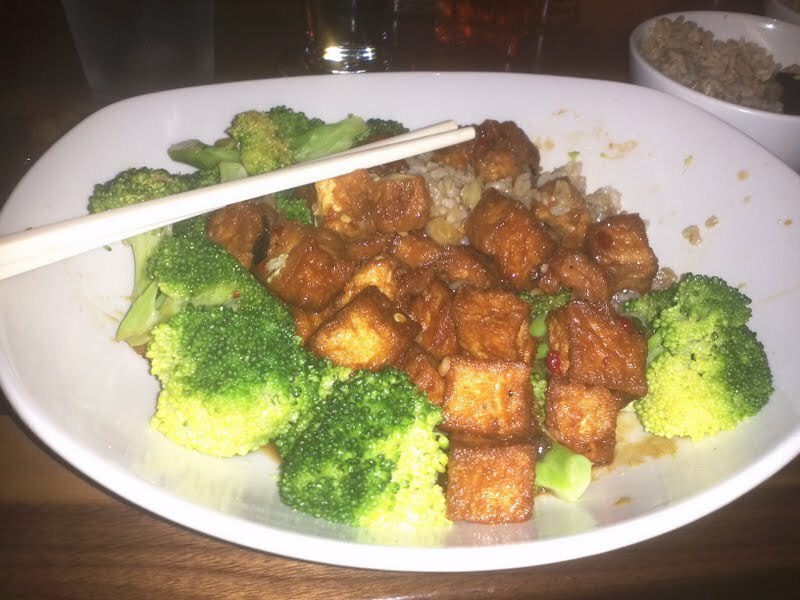 Chang's Ma Po Tofu and you get to choose white or brown rice; I chose brown rice! For a starter, we had the Chang's Vegetarian Lettuce Wraps that they made vegan by using the same sauce as in the Ma Po Tofu. The wraps were very tasty and had little cubes of tofu in them. Those also went right into my belly, too quickly to even snap a photo of them! As you can see in this post and in so many of my previous restaurant reviews labeled under "Review", dining out as a vegan is quite easy. I've never had a problem dining out, no matter what type of restaurant, no matter what veggie dishes they do or don't have on the menu. This is why it baffles me when people say they are or have been vegetarians with dining out issues. I find decent to amazing vegan food at any type of eatery, no matter where I go. All you really have to do is ask. And for now, the Dirty Vegan is signing off! While dreaming of Safari Fries! Tootles! Has Your Pup Been Skunked? Spicy and Sweet Stew with a Twist!